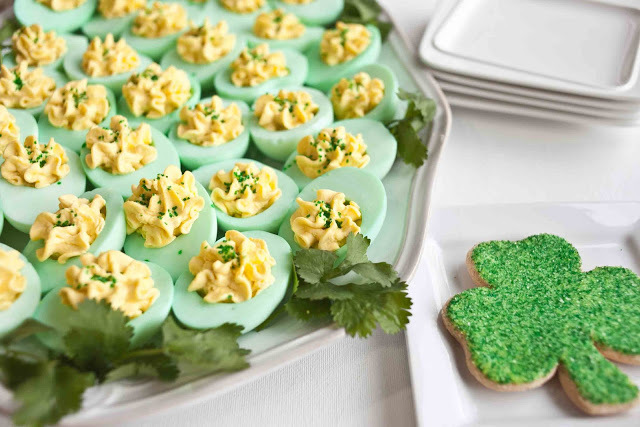 Everyone loves deviled eggs, so how about sprucing up a classic recipe to fit your St. Patrick’s Day party? Make these GREEN deviled eggs using only food coloring! We just love deviled eggs, and who doesn’t?! It’s the easiest snack food to make, and works great on any appetizer platter for any occasion! Take the classic deviled egg to a whole new level by making the egg whites green! They’d fit in just fine with your St. Patrick’s Day party! Surprise all your guests with these green deviled eggs that are so easy to make! 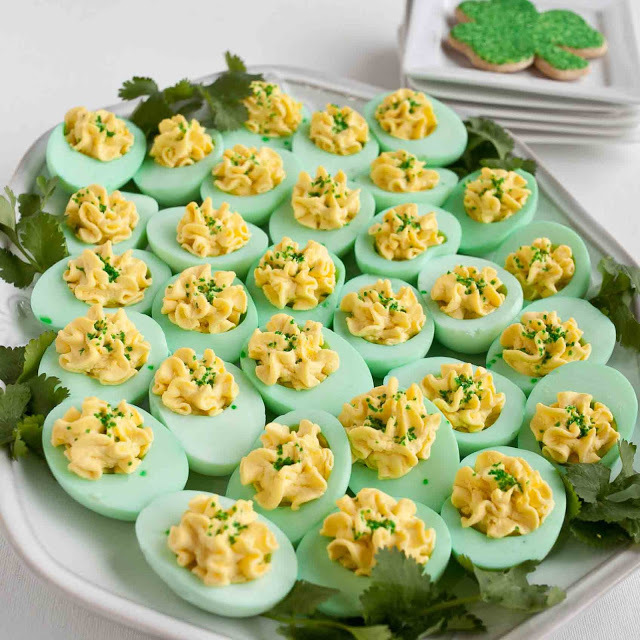 These festive deviled eggs would look great on your appetizer platter for your St. Patrick's Day party! 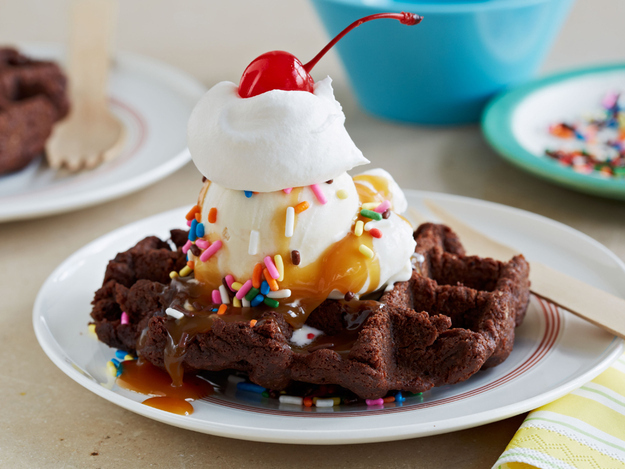 They're so easy to make and all you need is food coloring! Place your eggs in a large pot and fill it with water, enough to cover the eggs. Bring the water to a boil, then turn down the heat to low and allow it to simmer for 15 minutes. When the time is up, take the eggs off the heat and rinse them with cold water. Peel the eggs and cut them in half. Prepare your food coloring mixture. Fill up a few glasses with water and add about 3 drops of green food coloring in each glass. Add a tsp of vinegar in each glass to help the egg whites absorb the color. Place the egg whites in the glasses. Take the whites out when they turn a pastel green color, and place them on a paper towel to dry. Take your bowl of egg yolks and mash them with a fork. Add in 1/2 cup of mayonnaise. You can also add mustard, bacon bits, or chives to taste. You don't need to add salt because the yolks are already salty. Take a small spoon and fill the egg whites with the filling. Sprinkle a little bit of ground paprika over the filling. 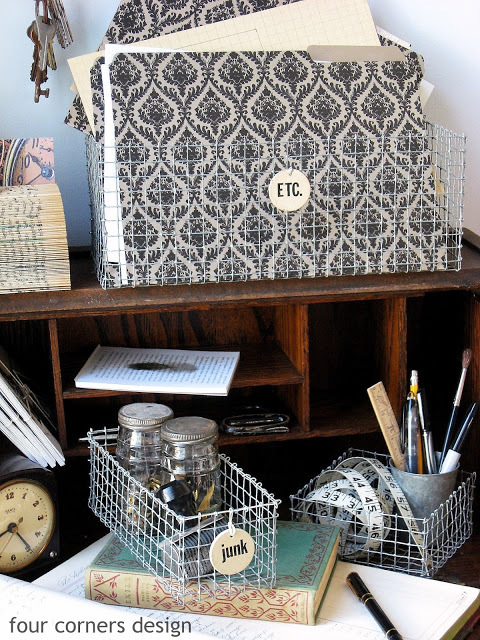 DIY: These Adorable Shabby Chic Wire Baskets are So Easy to Make, and They’re Budget-Friendly, too!